Accessible by dinghy from Mala (Anchorage 6) or Port Maurelle (Anchorage 7) Anchorages. 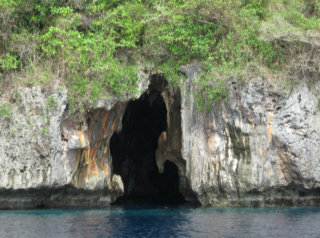 Swallows Cave is a visible cave on the NW corner of Kapa Island. 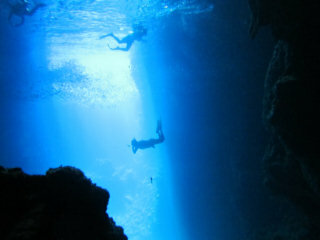 It can be done as a snorkel or a dive. Since the cave mouth faces west, it is best to do this in the afternoon. 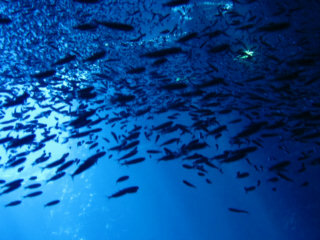 It is also a nice night dive in settled weather. 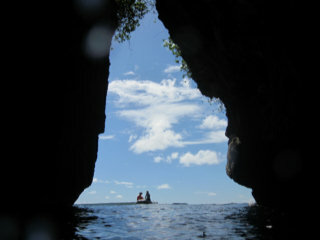 In calm weather, you can (carefully) drive your dinghy into the mouth of the cave, and tie it to a small pinnacle rock at the back of the cave. Be careful on entry in case other divers or snorkelers are in the area. The cave mouth is about 15' deep and about 20' wide. 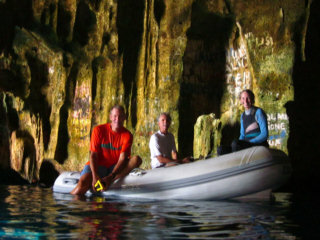 Take your time and explore the cave, snorkeling. On the surface, you can see inscriptions in the wall dating back to the late 1800's. There is also a second cave that you can scramble back into. 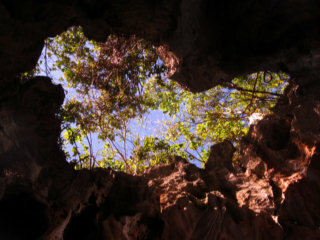 Birds are nesting in the roof of the cave. 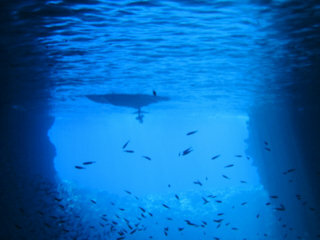 Once you are finished exploring at the surface, descend to the cave bottom. 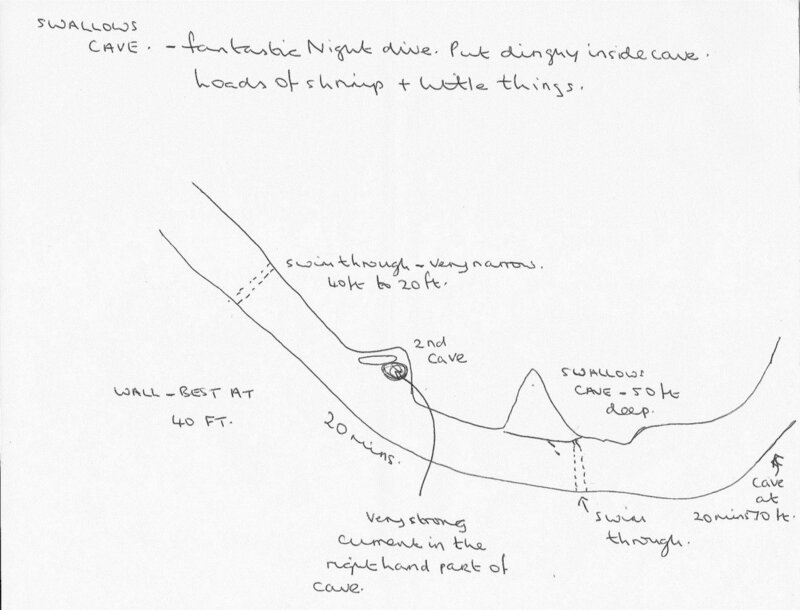 The cave bottom is at about 60'. Inside the cave it is somewhat barren, but still interesting. In the afternoons, the schools of small fish, and the light streaming in the cave, and people silhouetted against the cave mouth makes some very interesting (and challenging) photography. As you swim back towards the mouth, there is a second swim through at about 40', on the left (south) side of the entrance area. Exit the cave via this swim through. From here, you can turn either left or right. 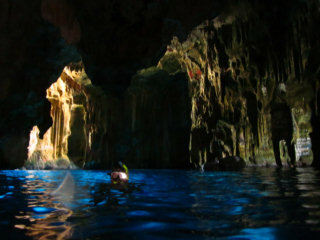 To the left, explore along the wall for about 20 minutes, and you will encounter another cave at about 70' deep. To the right, explore along the wall at about a 40-50'. At this depth, you will not see the entrance to the second cave, which is only about 10' deep. After about 20 minutes of diving at 40', you should encounter a narrow swim through that angles up and exits the same wall at about 20'. This is a good way to finish your dive. 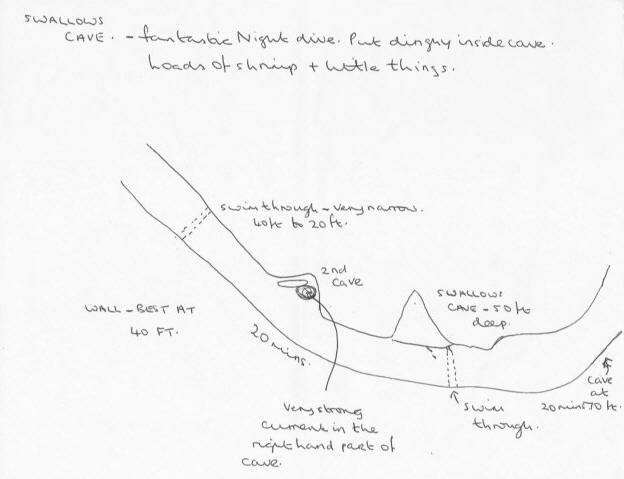 If you explore the 2nd cave, be aware that there can be a VERY strong current in one part of that cave (see sketch).